I don’t know about you, but I loved Downton Abbey, and I’m glad to see its stars succeed in other places. The show was basically a soap opera, but masterfully done, with characters you could fall in love with and a quality to the history that is almost matchless. The actors involved in it weren’t always the best, you’ll have that, but they made the show work, and I wish them all the best of luck. Hugh Bonneville in Paddington, Michelle Dockery in Good Behavior and Godless, Maggie Smith already a legend, Allen Leach in The Imitation Game, Lily James in Cinderella, The Exception, and Baby Driver, Jessica Brown Findlay who I think is the weakest of the cast to use the success of the show for other jobs, and then, of course, Dan Stevens, whose role was cut short because he understood what was about to happen to him; that his character had advertised his good looks and natural talent, that he was on his way to becoming a superstar. A look into the mind of a genius and an origin tale of one of the greatest stories ever told, The Man Who Invented Christmas is the magic of the season wrapped around a biography of perhaps the best author the English language has ever known. Charles Dickens was a success across the globe after his book ‘Oliver Twist’ hit the shelves, but his subsequent novels failed to impress, and more importantly, failed to make any money. He was running out of time, out of pounds, and out of friends willing to extend him credit, so he decided to write a story in a matter of weeks, self-publish it, and revive his career. Now, all he had to do was think of something to write. Having grown up in a workhouse, Dickens knew what money could mean, knew how important it could be, but also how greedy it could make the man who falls victim to its charms. And so he created A Christmas Carol, right in time for the budding holiday, and taught us all an invaluable lesson. Dan Stevens is currently my fave, and I’ll watch anything that he’s deemed worthy of his time. A Walk Among the Tombstones, The Ticket, Beauty and the Beast; Stevens is a talent on the rise, and all we are asked to do is pay attention. I do like him a little better when he’s allowed to be British, but check that off the list with this film, and Stevens delivers perhaps his best performance to date. He’s likeable as Dickens, funny at times, full of energy, and delivers a moral or two; what else can you ask for. 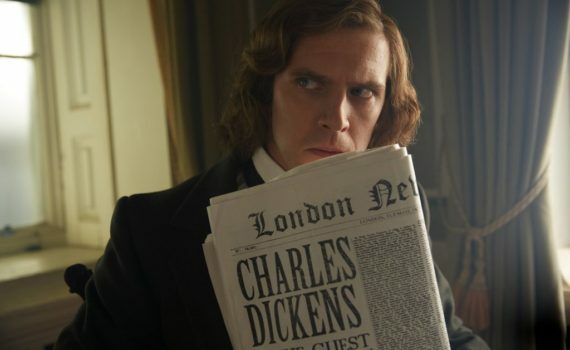 The story is true, Dickens was a social advocate, Christmas wasn’t a big, charitable deal yet in England, he based some of the story on his own experiences, so that part of the plot was rather interesting. Now, the film itself isn’t amazing, and I think I can put my finger on why. Basically, it’s a family film, with nothing in it I wouldn’t show my kids, a holiday/genre flick that’s meant to give us hope, teach us a lesson, show us the meaning of Christmas, and so on. That style of film might be a dime a dozen, but I could easily see this movie becoming a family tradition in many households, even if it isn’t the best thing you’re ever going to watch. It’s fluffy, easy, nice, and features Christopher Plummer as the Scrooge from Dickens’ imagination, so that can’t be bad. Just don’t expect the highest quality cinema and you’ll be in for a pleasant surprise.